Come meet Tommy at the St. Louis Woodworking Show. 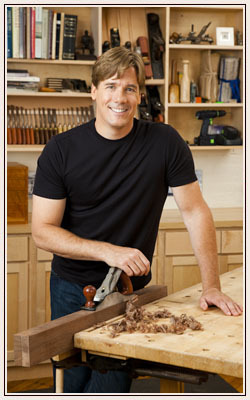 All you St. Louis area woodworkers should head over to the Woodworking Show taking place there this weekend at the Gateway Center in Collinsville, IL, to meet Tommy and hear his presentation on Building Better Furniture. The show runs from Friday – Sunday, and admission is free for children under 15 and all active duty police, fire and military folk with an I.D. There are a number of other notable exhibits and presentations to be seen at the show this weekend, so check out the Woodworking Shows website for all the info. 3 Responses to "Tommy at the St Louis Woodworking Show"
Enjoyed meeting you at the St. Louis show and hope you have continuing success with your show. I just wanted to say that I have been watching your show for a couple of months now, and I love it, I think that you have a very gifted way on how to teach wood working, I think you are awsome and hope your show last a long time. Keep up the great work, I would love to meet you one day. Enjoyed meeting you at the Collinsville Illinois home show! Mom and I appreciate the autograpgh and photos! You mentioned that I should blog regarding my beginnings of wood working and that you or Dave would be able to get me started. I’m interested in scroll work and have already got some fairly easy patterns to start out with. I help with projects in and out of the home, the family likes to do these tyoe of projects. I would like to try new hobbies to learn and this is an area I would like very much to explore. PS: Mom still counts how many “OK”s you mention in your episodes and loves watching-better than Norm (The New Yankee Workshop)!